Adorable babygrow by Patachou. Simulating a two-piece outfit, the top is made from gorgeous floral liberty fabric and the pants are made from jersey fabric. 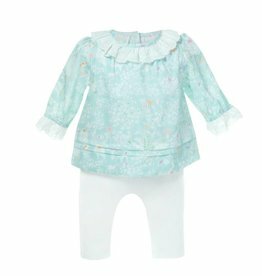 The small ruffles of the collar and the long sleeves are made from embroidered fabric.